February 9, 2007 "Just a couple of Hams"
Famous Amateur Radio Operator, Paul Bittner, WØAIH, from Fall Creek, WI, (near Eau Claire)visited with Mark at Gilbert Lodge. Paul, on the left, was first licensed in 1949 and just turned 73. Paul is a retired minister and finds plenty of time and desire to do tower climbing. He loved the Rohn 25 Tower in the entry way of Gilbert Lodge, complete with a "tower monkey." 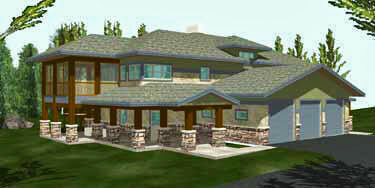 E-mail from Paul 2-12-07: That 20 foot Rohn 25 in your home is an absolute "knock out" for visitors like me, as were all the wires you so neatly attached to the ceiling in the power panel room! Absolutely the neatest I've EVER SEEN!! 73, Paul. Jim Offerdahl, his son Joe, and wife Ann visited Gilbert Lodge. 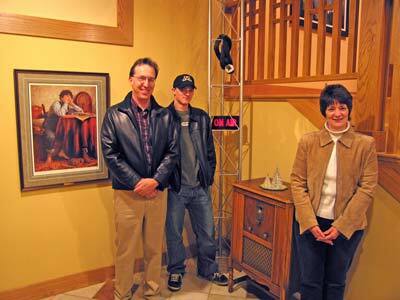 Here they are in the front entrance near a "Radio Daze" print by Jim Daly and a 1929 Majestic floor-model radio. Note the "On-Air" light on the tower. 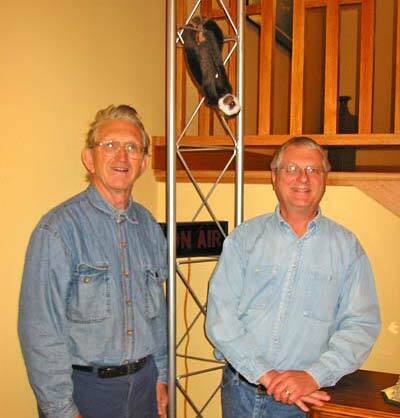 Jim is Mayor of the City of Fosston, MN, and is a radio broadcast engineer. His company name is Offerdahl Broadcast Service. What a combination! Joe is a real sports guy. See Joe is a sports person and wants to work as a sports reporter.